Like in many other African countries, piped water supply schemes in Uganda are increasingly replacing the traditional point source with the handpump. 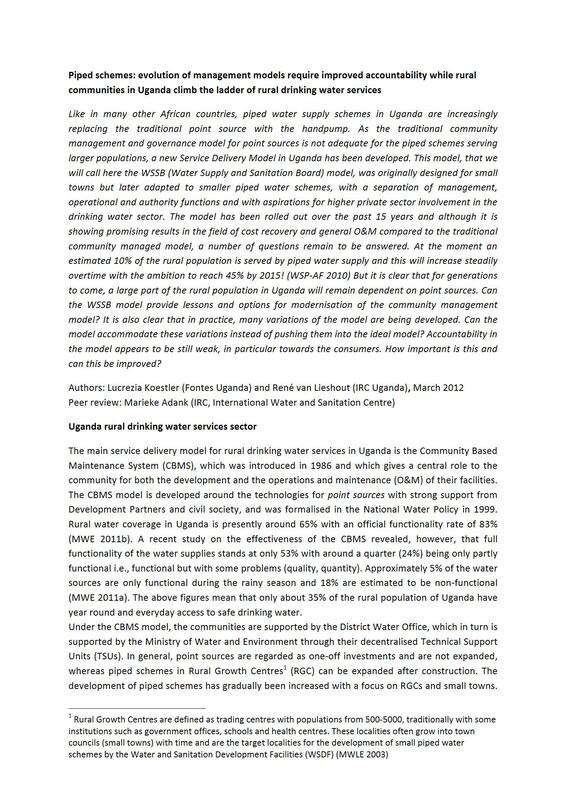 As the traditional community management and governance model for point sources is not adequate for the piped schemes serving larger populations, a new Service Delivery Model in Uganda has been developed. This model, that we will call here the WSSB (Water Supply and Sanitation Board) model, was originally designed for small towns but later adapted to smaller piped water schemes, with a separation of management, operational and authority functions and with aspirations for higher private sector involvement in the drinking water sector. The model has been rolled out over the past 15 years and although it is showing promising results in the field of cost recovery and general O&M compared to the traditional community managed model, a number of questions remain to be answered.